No other product in the world can do all that Tend Skin® Liquid does, especially when it comes to ingrown hairs and razor bumps. Razor Bumps: Razor bumps are created when growing beard hair exits the skin, curls over, and burrows into the adjacent skin, resulting in an unsightly "bump". Razor bumps form on the beard areas of men-mostly African American males and about 15-20% of Caucasian men. Occurrence varies with nationality. Ingrown Hairs: Ingrown hairs form when hairs, growing back after shaving, waxing, electrolysis, or other hair removal method, fail to grow out of the skin. The hairs curl over inside the follicles under the skin (just like the "razor bump" hairs curl above the skin). By curling, the hair creates and unsightly "bump". 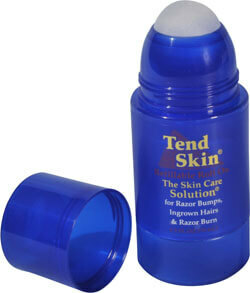 Tend Skin's Refillable Roll-On System is a 2.5oz refillable "roll-on" with an improved formula. The package has four parts; a reservoir that holds the product, a roll-on ball sleeve into which the product reservoir screws so the roll-on can be used, a cap that tightly seals the reservoir, and a cap over the roll-on ball. SAVE THE RESERVOIR CAP for travel to assure there is no leakage into luggage. Not only is the 2.5oz package airline legal but it can easily be refilled from a standard Tend Skin Liquid bottle. This means you can save money by purchasing the large size Tend Skin Liquid bottle and using it to fill the roll on package. Now you have the benefits of using Tend Skin Liquid with the convenience of a roll-on that minimizes product waste. No more cotton balls or peeling fingers! Directions: Remove shrink film. Product separates into two pieces, a reservoir bottle with a cap and a sleeve which has the roll-on ball and a cap over the ball. Remove small cap from reservoir bottle. Save cap for travel use. Insert reservoir bottle back inside the roll-on sleeve as it was before removal of shrink film. Screw the reservoir bottle into the roll-on sleeve. The product is now ready for use. Remove cap over roll-on ball as per standard roll on package and apply to skin. Before a waxing procedure, apply Tend Skin twice daily to areas of your skin that have ingrown hairs. After a waxing procedure, apply Tend Skin to the area in a sufficient amount to just dampen the skin. After 15 - 20 minutes all skin redness should be gone. 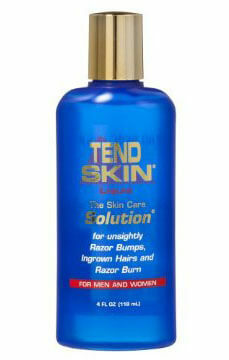 Apply Tend Skin 2-3 times weekly to maintain ingrown-hair free skin.